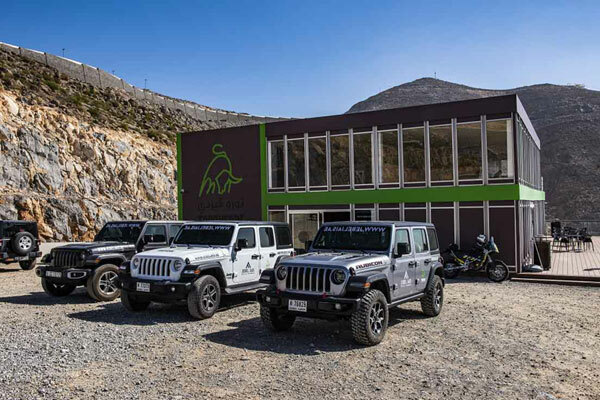 Jeep has signed a sponsorship agreement with Toroverde - designers of the world's longest zipline, Jebel Jais Flight, located in Ras Al Khaimah - to become the "on the ground" automotive partner for the adventure sport. Through this deal, Jeep ensures that the adventure begins right from the beginning of the journey with a fleet of the latest Jeep Wrangler models providing highly dependable transport and logistical support. Jeep offers much more than the best SUVs on the planet - the brand embodies a spirit that its customers share and has retained the brand’s legendary off-road capability while at the same time offering premium interiors, advanced technology and excellent on-road handling. Jeep Wrangler is the undisputed off-road champion and a unique vehicle for everyday urban adventures. The latest generation of the iconic Jeep Wrangler offers excellent levels of comfort and superior driving dynamics - this one-of-a-kind vehicle is writing a new exciting chapter in the legendary history of the Jeep brand, a story which began way back in 1941. The original 1941 Willys Jeep was never meant to be a consumer product, but simply a solution to a military requirement. At the time, the US Army needed a lightweight, nimble four-wheel drive vehicle that could carry up to four passengers across a wide variety of demanding terrains - today’s Wrangler retains that “form follows function” mentality, and you can still see echoes of that iconic silhouette almost eighty years later. The all-new 2019 Jeep Wrangler has been designed to offer enhanced on-road comfort to appeal to daily drivers as well as adventure seekers and zipline flyers - this has been achieved by adding an eight-speed automatic gearbox and upgrading the suspension, drive train and interior compared to the previous model - its suspension has been tuned to optimise on-road handling and ride comfort without sacrificing off-road capability, and Wrangler continues to utilise the proven five-link coil suspension configuration that was first used on the 1996 TJ model. With its fender flares, iconic seven-slot grille, foldable windshield and removable doors and roof, the 2019 Wrangler is stylishly capable and fun to drive - it offers plenty of open-air freedom, new LED headlamps and heavy-duty forged steel frame mounted tow hooks that are perfect for pulling less capable vehicles out of trouble. Inside, there’s a completely redesigned interior with ample storage space and thoughtfully designed ergonomics plus comfort and convenience features including a highly advanced infotainment system, available auto-dimming rearview mirror with integrated LED map lights, rearview camera, folding rear seats, lockable easy access storage bin in the centre console, storage nets and more. When it comes to off-road performance, the Wrangler JL is a powerful freedom machine. Its Trail Rated status, upgraded 3.6-litre Pentastar V6 engine, Selec-Trac and available Rock-Trac 4x4 systems are just a few of the reasons why the 2019 Wrangler’s capability is a force to be reckoned with. It also comes with a wide range of standard and available safety and security features including standard advanced multistage front airbags and available supplemental side airbags with sensor detection, Electronic Stability Control, Electronic Roll Mitigation and remote keyless entry with sentry key theft deterrent system - features that are designed to make your everyday driving a little easier and your vehicle more secure. The result is the most capable Wrangler ever, which, depending on the trim, include two advanced four-wheel drive, active, on-demand full-time systems plus Tru-Lock electric front- and rear-axle lockers, Trac-Lok limited slip differential and electronic front sway-bar disconnect. From the roughest terrain to city streets, the all-new 2019 Jeep Wrangler is perfectly at ease, delivering a modern design that stays true to the original, combined with more open-air freedom and advanced technology features in terms of safety and connectivity.